The red split lentil is also known as Egyptian lentil or Masoor dal. The common red types in Canada include: Crimson, Redcap, Redberry, Robin, Blaze, Rouleau and Rosetown with seed size of 30-40 grams/1000 seeds. Canada has several processing plants in Saskatchewan, capable of de-hulling (removing the outer seed coat) and splitting both red and green types of lentils for the world market. 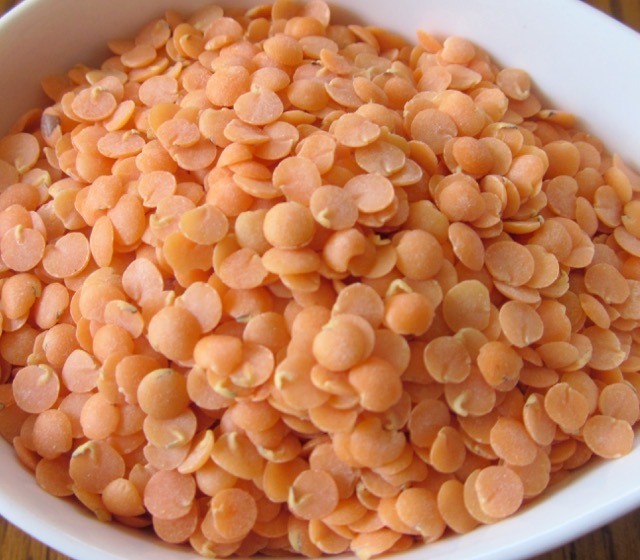 The red split lentils do not require soaking prior to cooking and cook in 10-12 minutes. During cooking, they disintegrate into puree and are therefore best for soups, thickening stews, curries and casseroles, and making dips. Before cooking, you should wash them in warm water to remove dust and dirt. Lentil is an important food source for millions of people worldwide. It has a mild, subtly sweet flavour. 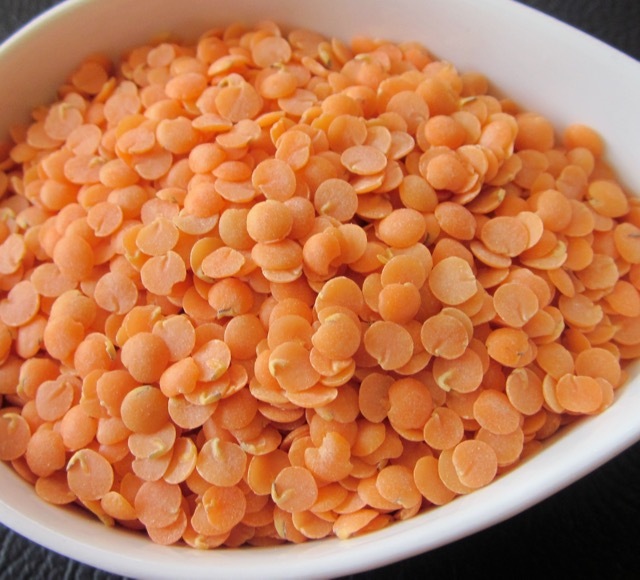 In India, split lentil, also known as dhal or dal, is used in soups and is consumed widely with nearly every meal. 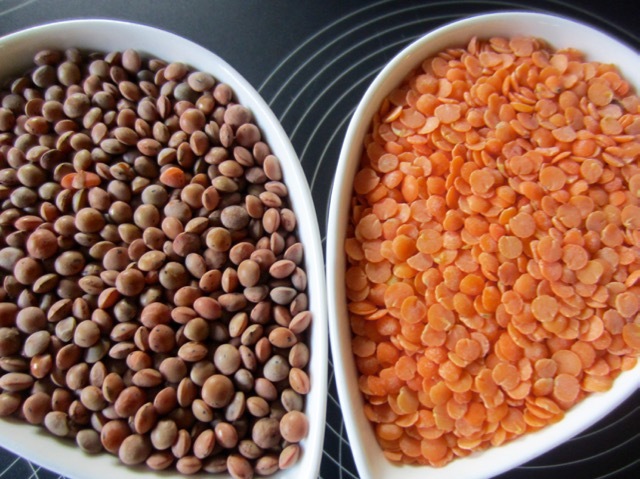 In southern Asia, red split lentils are used in curries. Lentil flour can be blended with other flours for added taste and nutrition. The blended flour can be used to make yeast and quick breads, muffins, biscuits, fritters, batter and pancakes. Lentil flour can also be added to baby foods for nutrition. Pureed lentils make a great addition to muffin and loaf recipes, contributing to moistness as well as adding fibre and protein. Amazing Lentil Recipes from Lentil.ca. Next What is Earl Grey Tea? These are indeed useful to keep on hand. They cook quickly and make a very nice spur of the moment soup, with carrots and cumin, for example. I totally agree with you. They are awesome! I always have some in the pantry! Me too. I have more than ten types of lentils, beans and peas! I’m trying to eat as much vegetarian as possible! I probably have that many too! I love red lentils – so cheap and healthy. I totally agree. So cheap but great nourishment! I was just inquiring about red lentils. I’m in the mood for my lentil soup recipe.